Can A Revolutionary New Health Aid Reduce The Risk Of Heart Disease - And Help Build Stronger Bones? Although universally accepted that Vitamin D is a key player in your overall health - including its potential anti-cancer properties - the name is rather misleading. Technically it is a potent neuroregulatory steroidal hormone that influences nearly 3,000 of your 25,000 genes. However, it has now been discovered that supplementing with Vitamin D as an isolated nutrient may encourage calcification of the arteries unless the body contains sufficient supplies of a supporting co-factor called Vitamin K. Scientific research has now established Vitamin K (K2) to be an essential nutrient, activating a number of proteins that enable calcium to build strong bones while helping to prevent calcium from accumulating in the arteries. Vitamin K helps out by reducing the amount of calcium circulating in the arteries that feed the heart. Hardening of the arteries is caused when too much free calcium circulating in the arterial tree gets trappped in lesions (plaques) that are a result of inflammation in various areas of the main arteries and aorta. When your body senses that a part of the artery has been injured (usually a consequence of poor diet and lifestyle choices) it will automatically send LDL (together with cholesterol) to the damaged area in an attempt to heal the injury. However, any oxidised LDL, excess calcium, heavy metals and other unwanted junk that is circulating in your blood stream will be drawn to the injured area of the artery and will begin to form a plaque (a scab covering the injury) that over time may well grow in size to become a major or even fatal blockage. Researchers from Leiden in the Netherlands found that people eating one ounce of Dutch cheese a day (Dutch cheese contains Vitamin K) lived on average seven years longer than those eating little or no cheese! That single statistic on its own is astonishing, and all the evidence now points to Vitamin K2 being an important nutrient to include in our diet. The research linking Vitamin K2 to human health is very new, and indicates a vital role it has in keeping blood vessels flexible by stopping or reducing hardening of the arteries. Unfortunately some Doctors may not be aware of this important research, as it is not normally covered during training at Medical School. • The production in the human body of Vitamin K is suppressed by Cholesterol lowering drugs (Statins) such as Lipitor and Zocor. Statins also suppress the body's own natural ability to manufacture CoQ10, a vitally important nutrient that supports a healthy heart. • Hydrogenated oils and trans-fats in margarine and baked/processed foods may stop the proper utilization of vitamin K.
• Antibiotics - including chlorine in drinking water - destroy intestinal flora, which are the source of making vitamin K in the human gut. Vitamin K may stop the build-up of Calcium Plaques in the arteries and help prevent Osteoporosis: A clinical study from Rotterdam, Holland revealed a correlation between long term adequate Vitamin K2 intake and a lower incidence of calcification in the wall of the aorta. In fact, arteries with no plaques had a 20 to 50 fold increase in Vitamin K2 concentration when compared to arteries with arterial plaques. The arteries with a high K2 content were noted to be more flexible and elastic than arteries lacking K2. Lack of Vitamin K2 causes calcium to fail to be deposited in bones where it belongs and to be deposited instead in arteries, aorta, soft tissues including muscle, breast, kidneys and in heel spur. A protein called osteocalcin transports calcium to bone and Vitamin K2 (menaquinone-7) is used to solidify this calcium into the bone matrix. When Vitamin K2 is lacking, the calcium remains in the blood and ends up getting deposited in the walls of arteries and other areas of the body which is very undesirable. Thus Vitamin K2 becomes a critical nutrient for both bone and arteries. Vitamin D3 is more effective at maintaining blood levels of the sunshine vitamin during winter months than the D2 form, says a new study. “To our knowledge, this is the first study comparing vitamin D3 and D2 by mapping the time course of serum 25(OH)D from the summertime peak through to the wintertime nadir,” wrote researchers in the British Journal of Nutrition. Many researchers agree that the majority of people are vitamin D deficient and need vitamin D supplements, but the form and recommended dose are still hotly debated. 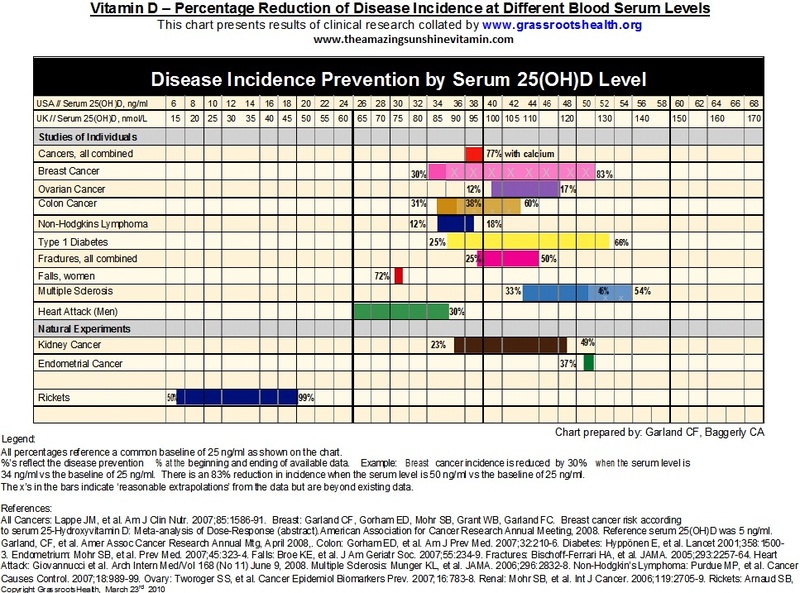 However, several new studies have reported that the D3 form of the vitamin is more potent that D2, with a study led by Robert Heaney, MD, from Creighton University in Nebraska reporting that D3 was 87% more potent than D2 (Journal of Clinical Endocrinology & Metabolism, doi: 10.1210/jc.2010-2230). The first-ever systematic review and meta-analysis comparing the effectiveness of the vitamin D forms also recently concluded that D3 was better than D2 (American Journal of Clinical Nutrition, doi:10.3945/ajcn.111.031070). The new study, by scientists from the University of Otago in New Zealand, found that 1,000 IU of vitamin D3 maintained 25(OH)D levels during winter months, whereas 25(OH)D levels decreased with the same dose of vitamin D2. Study details: Led by Victoria Logan, the researchers recruited 95 people aged between 18 and 50 to participate in their randomized trial. Participants were divided into 3 equal groups: The first group received placebo, and the second and third groups received 1,000 IU daily doses of vitamin D2 or D3 for 25 weeks starting at the end of summer. Results showed that vitamin D3 levels decreased as a result of D2 supplementation, whereas 25(OH)D3 levels were maintained in the D3 supplementation group. “Overall, total serum 25(OH)D concentrations were 21 nmol/l lower in participants receiving vitamin D2 compared with those receiving D3, among whom total serum 25(OH)D concentrations remained unchanged. “These findings contribute to the accumulating evidence that vitamin D3 and vitamin D2 have different pharmacokinetic profiles for serum 25(OH)D,” wrote the researchers. “As a result, care should be taken to distinguish the form of vitamin D used for both clinical studies and therapeutic use, particularly given that the dose employed in the present study is commonly used in over-the-counter dietary supplements.